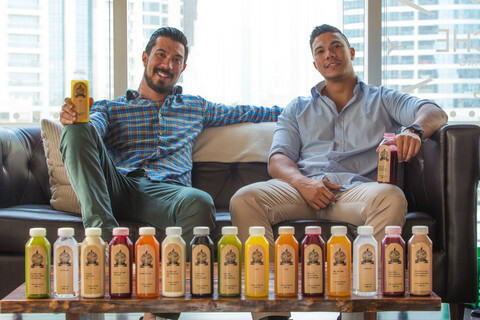 ‘Organic Press’ – a 100% homegrown company is a concept brought to life by two health-conscious brothers, Daniel and Chris Vahanian who only aim at encouraging a healthier lifestyle in Dubai. They introduced the concept of ‘cold-pressed’ juice – A techniq ue that significantly retains natural nourishment in comparison to traditional juicing methods such as blending. One bottle of Organic Press juice contains approximately two pounds of unadulterated, 100% organic produce. Their juices are not pasteurized, and with proper refrigeration they will maintain their nutritional stability and will taste crisp for up to 72 hours. Juices from Organic press has no pulp as they create every juice ‘hydraulically’ by pressing fresh fruits and vegetables between two steel plates that doesn’t heat or oxidize the produce. The result is a nutritionally-packed, fresh juice that is loaded with enzymes, vitamins, trace minerals, and other vital elements the human body needs. Beginners Cleanse [AED264 per day for 6 juice bottles] – Designed for those who want to gently commence the detoxification process. Intermediate Cleanse [AED264 per day for 6 juice bottles] – A balanced detox tailored to those who have experienced juicing. It is Slightly more intense than the Beginners Cleanse. Expert Cleanse [AED264 per day for 6 juice bottles] – The Expert Cleanse is geared towards green juice lovers and health enthusiasts. Premium Cleanse [AED310 per day for 8 juice bottles] – This is designed for those who are willing to take on the ultimate alkaline challenge. This detox contains little to no fruit and is a very powerful cleanse! Being a girl whose survival kit includes a lot of desserts; a sudden change in lifestyle to consuming greens and only drinking juice is super challenging However, receiving automated motivational emails everyday from Organic Press gives a personal touch to your experience. 1. The cleanse is not a piece of cake. You need a lot of will-power if it is your first time. 2. It is expensive. However, doing it occasionally is definitely a benefit to your body. 3. It can be a little complex/challenging to complete all 6/8 drinks at regular intervals daily.